I said I would tell you why I was roasting and peeling red peppers a little while ago. Well, here's the reason. When I first started hanging out at my local knit shop a few years ago, we would often order hummus from the Middle Eastern restaurant down the street. When we would go to pick it up, the owner would give us free samples of dishes he was working on for his menu. One of the dishes was a roasted pepper walnut dip, about the same consistency as hummus, that was super spicy. He named the dish Appetizer Aladdin, after his restaurant. I had never seen anything like it before, so I assumed it was some kind of takeoff on harissa, a North African sauce made from peppers and tomatoes. Whatever it was, it was delicious and we ordered it all the time. It was really good with some hummus to temper the heat a little. After I got those lovely guajillo peppers for my birthday, I looked them up and discovered that they were sometimes used in making harissa, so I thought I might make some. 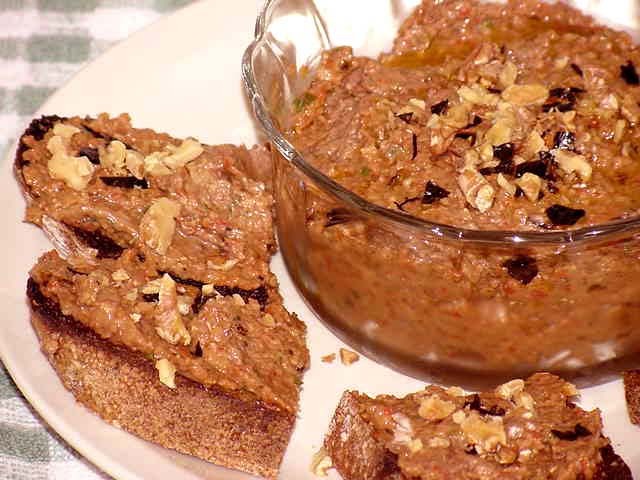 But in looking for recipes, I discovered recipes for a dish called Muhammara, a red pepper and walnut spread that sounded just like the Appetizer Aladdin. One of the recipes I found was in the cookbook I reviewed for Foodbound, called Spice: Flavors of the Eastern Mediterranean, by Ana Sortun. Since I like to try a recipe with any cookbook I review, I decided to make the Muhammara. 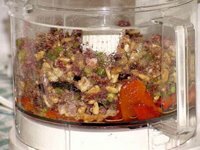 Once the peppers were roasted and peeled, this was easy to make--you just throw everything into the food processor and process until it's the consistency you like. Mine came out pretty thick, I had to thin it out with some hot water. With the bread crumbs, it continued to thicken in the refrigerator and I had to thin it out every time I wanted to use it. I don't think the breadcrumbs are necessary and I will probably leave them out next time, or maybe only use a quarter of a cup. This makes a nice change from the usual hummus and tabbouleh you see at parties. Bring this to your next outing and it will be the hit of the party. It's equally good on toasted bread or with pita. I didn't have Aleppo or Urfa chilies, so I used Pasilla and Guajillo. At first it didn't seem very spicy, but the more it sat the hotter it got. Remove as many seeds from the red peppers you can and place them in a small mixing bowl. Add the rest of the ingredients (minus garnishes) and place in food processor. Process ingredients until smooth. Season to taste with salt. This is best after one day. Garnish and serve with toasted pita or crusty French bread.Makes about 2 cups.